Guillermo Gutierrez, KRAG (detail), 2017, assemblage of found objects. EPMA, purchase with funds donated by Peggy and Andy Feinberg, Susan Foote and Stephen Feinberg. Artists’ ideas come from many places, including culture, history, personal experiences, and beliefs. Ideas Unwrapped presents fourteen artworks from the El Paso Museum of Art’s permanent collection that focus on how ideas transform into art. Filling EPMA’s Mac Rogers Gallery and Ginger Francis Seminar Room, the exhibition features works by internationally known artists Peter Coffin, Vik Muniz, Juan Quezada, Yinka Shonibare, and Kara Walker, as well as El Paso artists Guillermo “Memo” Gutierrez and Zeke Peña. Ideas Unwrapped is family-friendly and interactive, offering new ways of looking at and understanding art. In the Mac Rogers Gallery, through augmented reality technology, experience sounds and music while seeing art come to life. 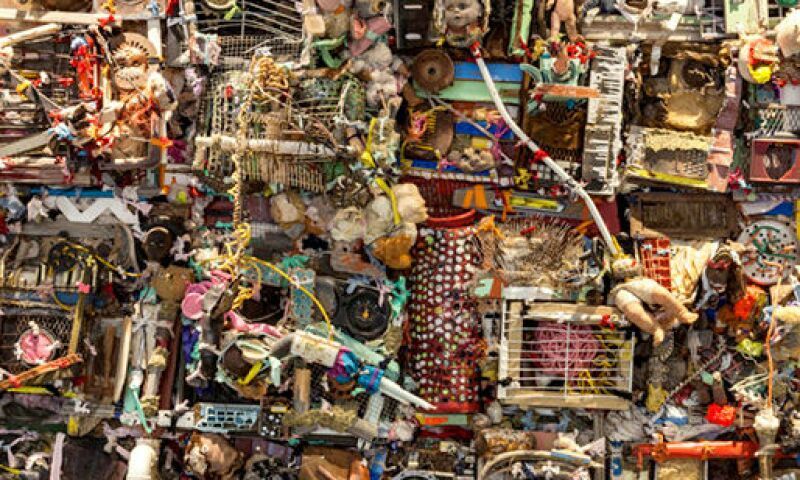 View the sculptural installation Krag, by El Paso artist, Guillermo Gutierrez, who collects objects from local landfills—discarded toys, outdated computer parts—and weaves them together to construct a work of art that connects cultural leftovers in unexpected ways. Complementing this, EPMA’s Ginger Francis Seminar Room features pottery by Mexican artist Juan Quezada and artists from Northern Mexico, along with an activity. Ideas Unwrapped offers a new perspective on how artists are inspired, and create.